Demand for bicycle parking at the new McLean Station exceeded capacity in the Silver Line’s first few weeks, so Metro has already added more racks. When Metro planners learned that bike racks were not prominent in the Silver Line station designs (completed by our partners in Virginia), Metro fought hard to make sure that bike racks were planned for and installed at the stations. And that’s good news, indeed, because by August, nearly all of the bike racks were full at McLean station. Recognizing this need, Metro added space for 20 more bicycles (10 racks) at the station. The new racks bring the total capacity for bikes to 72 on racks. Bike lockers are still available at McLean, too. Increasing bike access to the Silver Line is a good sign for ridership, revenue, and station access. Metro will keep an eye on utilization this fall and add capacity where needed. Nearly full bike racks at McLean station on the Silver Line a few weeks ago, before Metro added more racks. 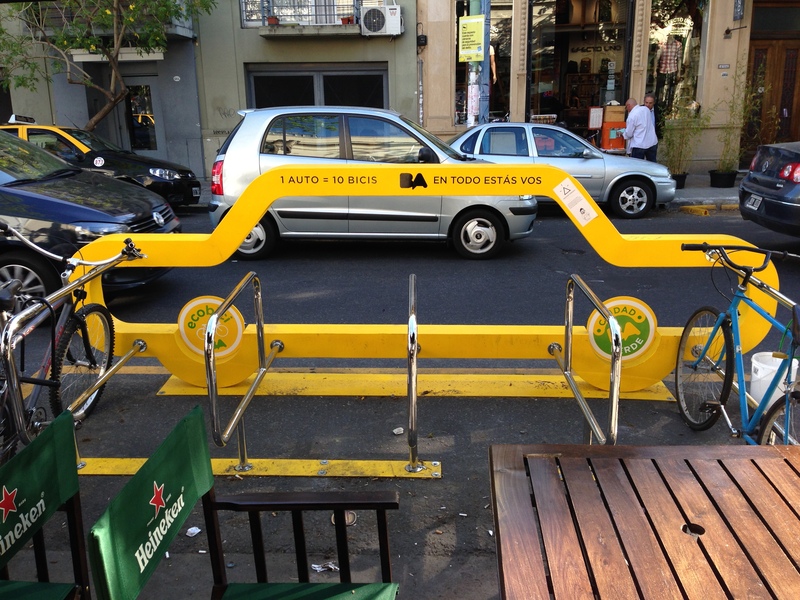 On-Street Bike Parking in Buenos Aires. Photo by the author. I spotted this cool on-street bike rack in the trendy Palermo neighborhood of Buenos Aires. It says “One car = ten bikes”. It’s a very cool, visual way of providing bicycle parking in a neighborhood with narrow sidewalks and heavy pedestrian activity that also educates the driving public on the efficiency of travel by bicycle and the need for on-street bike infrastructure. Metro’s planners recognize that bike parking is a really efficient use of space and a cost-effective way for us to provide alternatives for how our riders get to our stations. Read more about Metro’s bike parking efforts on PlanItMetro. Editor’s note: we have been made aware that this bike rack design is very similar to or perhaps based on a bike rack design by a company called Cyclehoop. Congrats to Cyclehoop for such an innovative and educational design. Bicycles parked at racks at Metrorail stations inched up again this year, and Union Station is now Metro’s number-one station for bicycle access. Union Station is now the busiest Metrorail station for bicycle access. 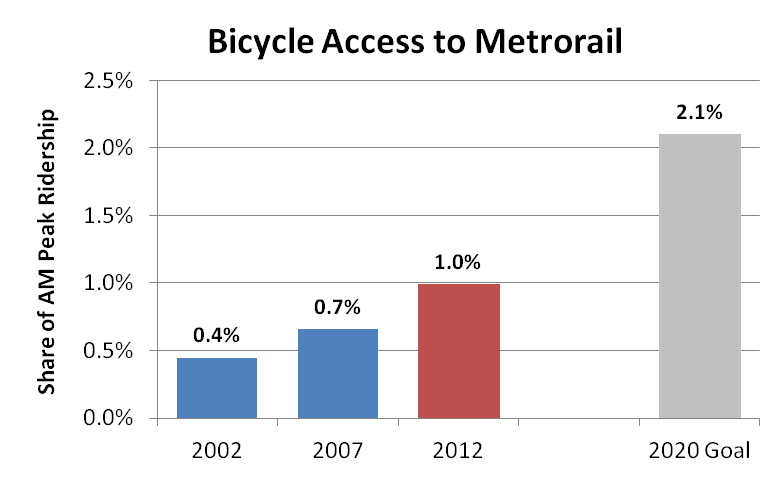 Using bike rack counts – one of two ways we gauge bike-to-rail access – bikes parked at Metrorail stations increased by 1% in the last year. The number of bike racks increased 20% over the same time period. (The second measurement of bike access from theMetrorail Passenger Survey was published last week here). Overall bikes parked is up slightly above 2012. However, we observed each station only once or twice, so it is difficult to discern long-term trends from short-term variation so far. Union Station is now the single biggest station for bicycle access, not including bikes parked inside the BikeStation there. 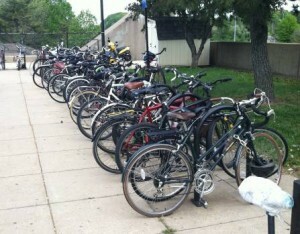 We counted 130 bikes at that station, well beyond the capacity at racks. Bike parking capacity is up 20% since 2012, including the College Park Bike & Ride. 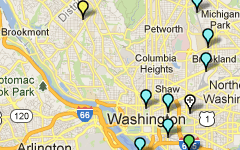 Metro now has space for over 5,000 bicycles at stations. We (and our partners) continue to add bike parking capacity to stay on track to reach our goal of 7,000 bicyclists by 2020. Bike use increased at several major stations such as East Falls Church, Vienna, Greenbelt, and NoMa, but decreased at other stations such as King Street, Braddock Road, and Franconia-Springfield. Bicycle numbers remained about even at several perennial heavy-hitters like Medical Center, Takoma, Grosvenor, and Columbia Heights. The number of Metrorail customers riding their bike to the train station increased by 50% over the last 5 years, as Metro makes progress towards its 2020 goal to attract more bicyclists. More cyclists are accessing Metrorail by bike than ever before. According to results from the 2012 Metrorail Passenger Survey, the number of riders bicycling to Metrorail in the morning rush hour increased from around 1,550 to over 2,380 per day between 2007 and 2012. Bike access to Metrorail now accounts for 1% of entries each morning, which moves us closer to our Board-adopted goal of over 2% (over 7,000 bicycles!) by 2020. In this survey, riders who access rail by bicycle in the morning peak could be taking Capital Bikeshare to the station, riding and parking their own bike at the station, or bringing a folding bike on-board. The Passenger Survey is one way we measure bicycle access. 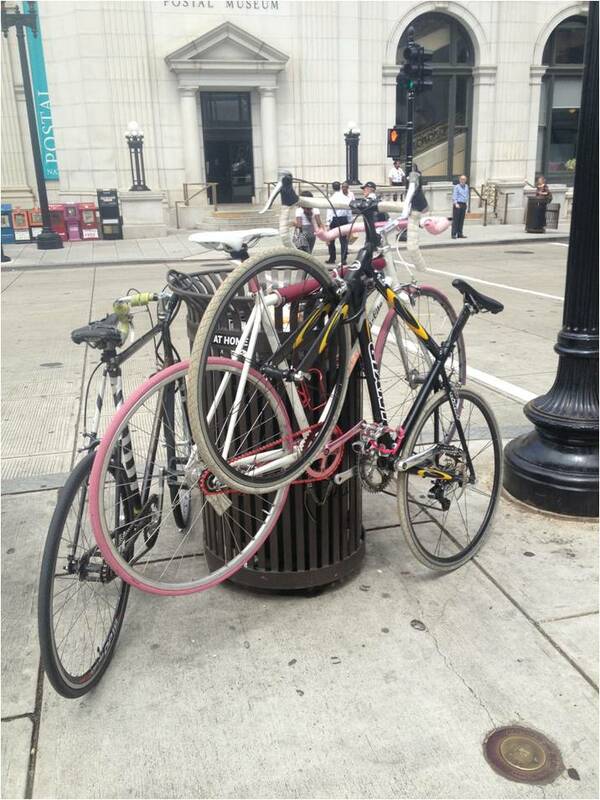 We see a similar pattern in our annual count of bike racks at stations each spring (currently nearing completion for 2013, stay tuned). The growth in bike access has happened at the same time as bicycling is increasing generally in the region, and as Metro has added more bike racks at stations to accommodate and encourage bicycling, including a secure Bike & Ride parking prototype facility at College Park station. Metro’s Parking Office recently completed new bike rack installations at Shady Grove and Brookland-CUA stations, with parking for over 80 additional bicycles. This work was completed as part of our Pedestrian and Bicycle Capital Improvement Program. 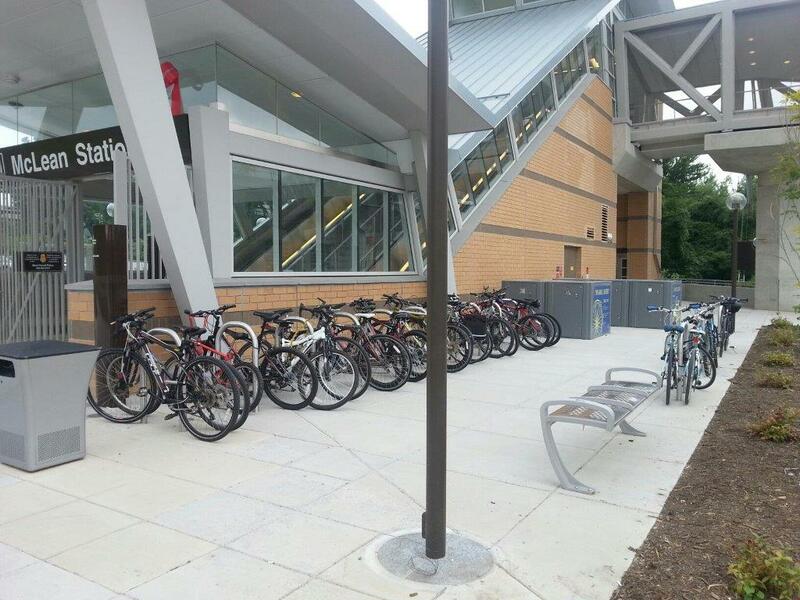 The new racks at Brookland are located on the west side of the station, just off the Metropolitan Branch Trail. At Shady Grove, the new bicycle racks are in two places on the west side: near the station entrance and bus loop, and near the Kiss & Ride loop where bicyclists had previously locked to handrails. Next up? Pedestrian improvements at Glenmont station – stay tuned! In May and June, Metro staff traveled the region counting parked bicycles at all Metrorail stations. These bike counts help measure our progress in attracting bike-to-rail customers, and are a key piece of data when we plan for bicycle facilities in the future as part of Metro’s Pedestrian and Bicycle Element of 2012-2017 Capital Improvement Program. Here are some results. Similar to last year’s counts, the objective of the census was to measure the general availability of, and demand for, bike parking around Metrorail stations. Regardless of who owns the racks, we want to know how easy it would be for a passenger to find a place to park a bike near a station at peak times. So, we counted during a six-week window on sunny, warm days from May 1 to June 15, between 9:30am and 3:00pm. We excluded bike lockers, the Union Station Bikestation, and the College Park Bike & Ride (we counted the racks at that station shortly before that facility opened). We counted each U-Rack as space for two bikes, and used our best judgment for other racks. 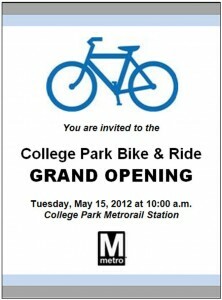 Metro will hold the grand opening event to launch its first “Bike & Ride” tomorrow – Tuesday, May 15 at 10:00am at the College Park-U of MD Metrorail station. You are invited to join us that morning, where you can hear a few words from some elected officials and Metro leaders, take a few photos, and tour the facility. Ready to get started? Sign up now for a $20 BikeLink card, read the brochure, and you’re on your way to secure bike parking. Already tried out the facility? This first Bike & Ride is a pilot project to try a new kind of bike parking, so let us know what you think! With the facility, Metro hopes to attract more bike commuters to rail by offering customers convenient, flexible, and secure bike parking. Metro’s Parking Office will operate the facility, with help from BikeLink. Metro hopes to learn from the design and continue to expand commuters’ access options as part of the Pedestrian and Bicycle Element of the Capital Investment Program. So, let BikeLink and us know what you think of the facility! Metro has been busy in February and March installing and upgrading bike racks, preparing for the upcoming bicycle season. Metro’s Plant Maintenance crews installed over 70 new racks, with space for 140 additional bikes at Braddock Road, Glenmont, Morgan Boulevard, Rockville, East Falls Church, Takoma, and Dupont Circle. We continue this work under Metro’s Pedestrian and Bicycle Element of 2012-2017 Capital Improvement Program. Since our last update, Metro’s Plant Maintenance crews have installed new bike racks with additional space for over 140 bicycles at 7 more stations in January. New racks have been installed under existing overhangs and other spaces at Capitol Heights, Stadium-Armory, Rhode Island Ave-Brentwood, Potomac Ave, Largo Town Center, Van Ness-UDC, and Glenmont as part of “Implementation Strategy 1″ in Metro’s Pedestrian and Bicycle Element of 2012-2017 Capital Improvement Program. We’ve been taking pictures along the way! We took these right after installation, sometimes in the cold or rain, so there aren’t many bikes on them yet, but we hope to be all ready for the biking season to begin in the spring. Glenmont pictures coming soon.